Aconcagua Dispatch: January 13, 2014 – The Team is Together at Last! January 13, 2014 – The Team is Together at Last! Our international climbing team at the provincial park office, excited to begin their adventure together! 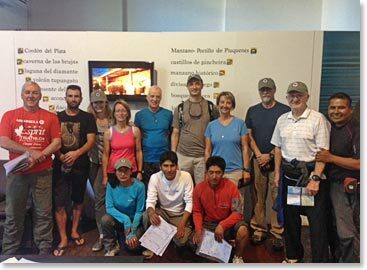 After a good night’s rest at the Park Hyatt in Mendoza the team woke up nice and early to go to the Aconcagua Provincial Park headquarters where we were issued our climbing permits for the mountain. Ever wondered why we call ourselves Berg Adventures INTERNATIONAL? This year we were thrilled to find out we have climbers from Brazil, Australia, New Zealand, Switzerland, Bolivia, United States and Canada! All of us climbers have arrived from different parts of the world with one goal in mind; to stand on the summit of the Western Hemisphere! Keep following as we post daily updates from our Aconcagua expedition!